This pocket watch has "mechanical movement" and is made in the UK. It features a pewter front with knot work surrounding a thistle, the flower of Scotland. 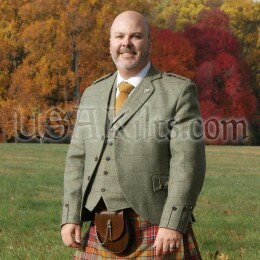 This is an excellent accessory for a casual, semi-formal, or formal kilt outfit with jacket and waistcoat. I have received great satisfaction with this watch. Of course, at $40, this is not a diver’s watch, a fancy aviator’s or mariner’s chronometer, or other expensive time piece, but it is an elegant looking pocket watch and chain to wear with one’s waistcoat, or in America, one’s vest. It is hard to find a criticism. Before you even get to looking at the watch you will notice that it comes in a quite well made little box. Doubtless this is of a heavy pressboard of some sort, and it is covered with a black embossed pebble finish paper. While it can be regarded as just packaging there is enough solidity to it that you realize that unpretentious as it is, you will want to keep it as a permanent container for the watch, when you are not wearing it. The first thing that I noticed about the watch itself was its heft. It feels very solid and weighty in your hand. There is nothing like a little real weight to make you feel that there’s some value to a functional object. As an example of the quality and thought that went into this watch, the chain is not simply crimped to the ring at the top of the watch stem, and the ring at the bar which retains the chain in a button hole. Instead there is a rugged little snap hook at each end. They could have made a bit more money by eliminating these snap hooks but their presence allows you to swap chains entirely if you have a family heirloom watch chain, or detach the bar normally used to attach to a button hole and clip into a secure point sewn into the particular garment. The pewter cover over the crystal is not just a stamped piece of sheet metal. This is quite a thick cast pewter piece which allows the Celtic knot work and thistle design to be quite deep. This is not a design which is going to wear off. In keeping with a lot of modern pewter work the recessed area of the pattern have been artificially darkened or “antiqued”. This looks fine, though I must admit that a plain polished pewter cover on which the recessed areas gradually darken naturally would be more to my taste, but I guess most of us don’t care to wait these days for these natural processes to take place. It does look good just the way it is. Three quick points that save a bit of frustration: First you open the case by pressing on the stem top. Don’t try to pry it open, you might break something. Second, you are going to have to eventually have the battery replaced by a jeweler. Most of us aren't equipped to open the back of this case without damaging it. If you only use the watch occasionally you may want to stop the watch with the little plastic tab to make the battery last longer, but it should last quite a long time. Third you may not notice that the crystal and the watch back are protected by clear plastic sheets that you pull off. Since these are soft and essentially invisible you may initially think you have a scratched case or crystal when it is the protective plastic just taking the wear of handling. With the chain secured to your waistcoat and the watch itself kept in one of the waistcoat’s little pockets this very nice pocket watch, made in Scotland, adds another touch of elegance to your outfit, when a wrist watch however fine would just not look as nice.